I have a 2,500 point World Eaters 30k list. 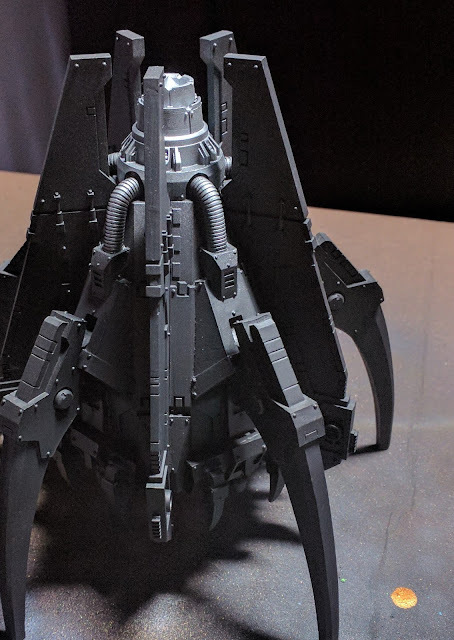 It has two Anvillus Dreadclaw Drop Pods. Assembly of this kit can be a bit of a pain, however, they seemed to go together pretty easily. Just remember your clamps. So after assembly I primed with the usual Stynylrez Black primer. I left this to dry for about 1-2 days, then came back in and put a base coat VMA Hemp. Next coat was the first layer of VGA Cold Grey. Now I am layering this color using the panel coloring method, a slight variation on color modulation. Then the final highlight of VGA Stonewall Grey. A funny thing when painting white, you don't really paint with white. Maybe an extreme edge highlight with VGC Dead White right at the end, but not yet. Then I started to block in the signature blue coloring with VGA Imperial Blue. I haven't finished with the blue yet, but I haven't quite worked out what direction to take it. Modulate or Panel highlight. Then VMA Steel was used on the claws, pipes, engine and control vanes. 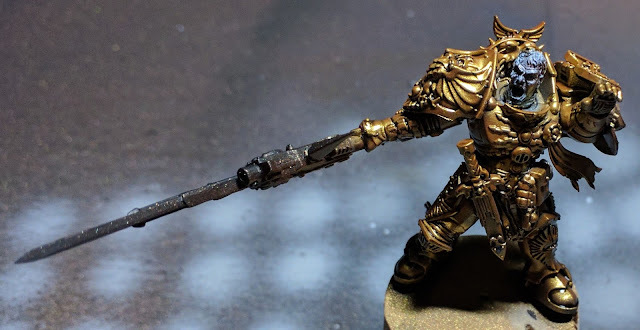 So I have been working on a little miniature that will be Constatin Valdor for my Custodes force. Here is a WIP on the progress. It all came from a post that I saw on G+ that got me thinking about how to build an Apollonian Spear. Starting out with the following three test pieces. First I tried using a Xenophase blade. Then I tried a Sanguinary Guard Power Blade. Then I stumbled across an idea using an AOS Stormstrike Glaive. Finally I settled on using the Sanguinary Guard Power blade, for the winged motif, with the spike from the Stormstrike Glaive. From there I got stuck into the rest of the miniature kit-bash. Once I sorted out the Spear I sorted out the base. You may recognize the ForgeWorld Garro base. Yup, I stole it from Garro and used it for my Valdor. Well he does out rank him, right ? Then I worked out the stance. you'll notice I was iterating through the weapons and stance during this stage. It finally happened, Book VII Inferno dropped. 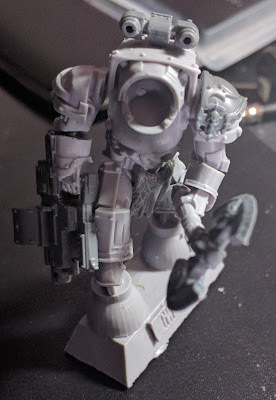 And being the VI Legion fan boy that I am, I just had to build a new Praetor. Hvarl Red-Blade. 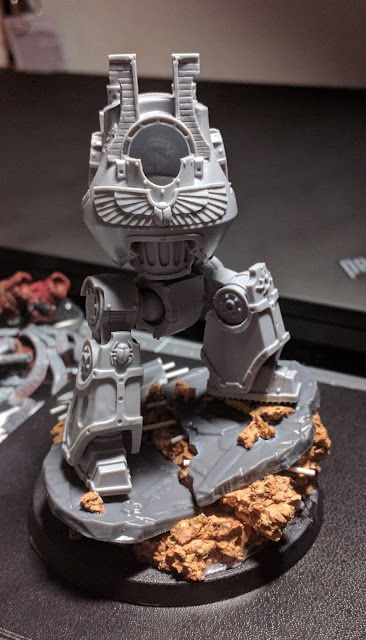 You'll notice a familiar miniature, the ForgeWorld Tribune in Tartaros armour. Couple that with a BoP Mk III Heavy Bolter, Tartaros Sergeant Shoulder Pauldrons and Wulfen Axe and rondels. Some liberal cutting, re-posing and green stuffing. I still have an issue with what head to choose, but I believe I will settle on the one below. And this is how he looks, ready for paint. So I ordered a Dreadnought for the CK Studios course, unfortunately it arrived two days late. That being said, I was still pumped from the course, so I started to build a the Dreadnought. One thing that always bugs me about Dreadnought builds is the static poses that you see. So I did my best to put some movement into this build. I tried my best to imitate and mirror the Konrad Kurze pose. 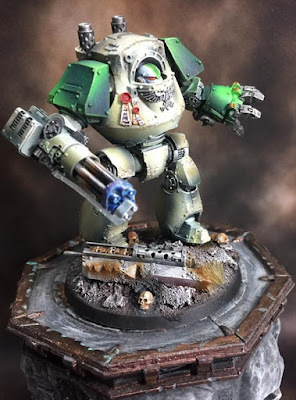 Now I just have to work out how I want to kit this Dreadnought. I am thinking Heavy Conversion Beamer and Power Fist. CK Studios Introductory Airbrushing Course #5 - How it all turned out? So now we have all the theory sorted, let's put this into motion. As mentioned before, this is how it turned out, but how did we get to this? Zenithal Highlight on the black primer coat. Base colours go over the primer coat. You'll see in the photo the triad+ of colours used. They are all Vallejo. For the Death Guard Linen White VGA Hemp, VGA Bonewhite, VGA Aged White and VGA Aged White. On the shoulders, I used the following for the Green, VGA Black Green, VGA Sick Green and VGC Goblin Green. You will notice, I haven't quite gotten the hang of the colour modulation on the Shoulder guards and Power Fist. So what do you do if you mess up your colour modulation? Well it's simple, you paint over it. The layers this style of airbrushing are so thin, it is easy to go back in and re-establish the dark tones and highlights . So after being bombarded with all this theory, how do we put this together? Colour Modulation is a technique where you fool the eye into thinking there is more volume and perspective over a flat surface. Panels are divided into light and dark and adjoining panels are opposite. So a light highlight will meet a different panel with a deep shade. Below is a diagram of how this will look. Arrows denoting the angles by which you shoot your airbrush.